Do you feel trapped with your regular office job? Does sitting behind the desk makes you feel uncomfortable and annoying? If yes, then how about the idea of becoming a bounty hunter! Sometimes dangerous, but financially rewarding, it is one of the finest career options for those who have a deep interest in international traveling and meeting new individuals on a daily basis. For such individuals, bounty hunting can be truly an adventurous and exciting job. So, if you too wish to explore everything about this amazingly wonderful career option, then let me brief you everything about becoming a bounty hunter and what all you will earn as rewards. The profession of bounty hunting was introduced when the government of Britain established the bail system in the late 17th century. There was a Bail Act passed by the British government according to which anyone accused for committing a crime can be released from the jail for a specific duration against certain sum of money. This entire process is known as bail. When the accused is released against the bail then a bounty would be put on to capture them if they do not appear in court. The professional individuals who are courageous enough to hunt out for such criminals are known as bounty hunters. Even today, the working conditions of a bounty hunter are the same as it was in the traditional times. But now, more new laws have been introduced in concern to this profession. Usually, bounty hunters are hired by modern bail bondsmen to catch fugitives. They are paid less than or equal to 10% of the original bail set from the judge. How to Become a Bounty Hunter? If you desire to become a bounty hunter, then you are not required to gain any specific degree but yes having a higher education degree is always valuable. It is first essential for you to complete your high education diploma. This is because it is your path towards completing and qualifying for any kind of diploma program or college course. There are numerous colleges out there offering bail enforcement diploma course. Before you plan going for the diploma program, you need to have complete understanding of the program. While theoretical knowledge is always beneficial, possessing practical knowledge and training will play a crucial role towards your successful career. With practical training, you can polish your skills and gain proper knowledge about successfully locating fugitives. To become a bounty hunter, you don’t require a degree. But it is essential to successfully complete the training program in bail enforcement, bounty hunting, and fugitive recovery. This is essential to gain the license from the state’s licensing department. Since a license is mandatory in most of the states, so it is essential to gain hands-on expertise on various skills of a bounty hunter. Networking, surveillance, apprehension techniques, research, and courage are some of the prominent skills required to become a bounty hunter. There are numerous training programs available for bounty hunters across the world. These programs are offered from community colleges and private academies. The duration of training program varies, but the aim is the same to educate bounty hunters about various laws and skills, which they need for capturing the targets. The training program usually covers topics, like negotiating, apprehension techniques, deception, interviewing skills, surveillance, investigative skills, and fugitive tracking. The certification and authenticity of the program is certified from the state. There are some states that need bail enforcement agents to complete a specific certified program to become a bounty hunter. You must contact the specific state’s department in order to gain knowledge about the program. Participating in the apprenticeship is highly important so that bounty hunters with similar professionals are available through specific organizations. If you work under a professional and expert bail enforcement agent, then this can help you gain necessary experience in the field. Most of the states require bounty hunters to gain license. The requirements and regulations for licensure may vary from state to state, but the applicants often need to be 18 years or above. It is essential to have a clean criminal record. Besides this, you need to complete the pre-licensure education, obtaining a surety bond. This bond confirms the payment of bail if in case a fugitive is not presented before the court. There are some states that need necessary work experience. Also, if you wish to carry a firearm along with yourself, then you require the permit as well as registration for the same. Once you are done with the training to become a bounty hunter and have availed the license for the same, you may then start looking for a job. The bail bondsmen usually hire experts and offer jobs to certified bounty hunters. Also, if you have a notification from the local law enforcement agencies to serve your bounty detective and hunting practices then your chances of getting the job as a bounty hunter is increased to a great extent. It is essential to continue education for renewal of licensure. This can help you to enhance your present skills as well as get familiar with new methods. For instance, you may avail appropriate classes in hunting and targeting the criminals, getting knowledge about the various bounty hunting laws as well as having proficiency in self-defensing and firearm safety. When there is help and support required from bail bond companies belonging to other parts of the region to find fugitives belonging to other regions, they may contact certified and registered bounty hunters from the National Association of Fugitive Recovery Agents or NAFRA for support. If you register yourself with NAFRA or any other similar association to other states, it offers you novel business opportunities. It is because such registration allows you to expand your potential clientele base. Continuing education is also essential to maintain the license as a bounty hunter. There are numerous states that need licensed bounty hunters to complete the education during the renewal period of the license. Besides continuing education, the license for bounty hunters need the successful renewal and completion of the application as well as the necessary payment as the renewal fee. The bounty hunter works as private agent to the bail bondsman. The person is offered with considerable powers permitting the experts to arrest, detain, locate, and transport in few cases of ‘Failure to appear’ or FTA are passed to the bounty hunter and agent. The bounty hunter and bondsman are not state performers and are mainly involved in private contract. In some regions, bounty hunters are not allowed to enter into the subject’s property without having a search warrant. The search warrant offers them with greater powers than those allowed by the law enforcement. Hence, bounty hunters contract with a bondsman for locating and apprehending those who have not been able to appear at court. There are few bondsmen who maintain in-house recovery agents, a large numbers of them opt to contract for that function. Out of numerous regions in the world, United States is one such country that permits fugitive recovery in this context. Possessing self-defense, detective, and investigative skills can help bounty hunters to identify fugitives and to take them into consideration without experiencing any physical harm to you. You can gain hands-on expertise on detective skills by availing a course from any reputed detective training institute. This course will educate you about the ways to conduct background investigation and research into the criminal past of the individuals. Also, the course tells people about surveillance techniques to follow individuals, interview people as well as deal with dangerous and risky situations. The self-defense classes will provide you with awareness, verbal confrontation skills, and assertiveness to be secured while identifying and targeting any dangerous fugitive. This job is not a usual desk profession and hence you need to possess adequate problem-solving skills as well as alert mind to deal with various situations and accused criminals. It is essential for you to possess strong networking skills so that you can find adequate relationships with the bondsmen as well as look a suitable job for yourself. The licensing requirements to become a bounty hunter vary from state to state. In few states there is no licensing needed to become a bounty hunter, but in most others a license is needed to be a part of this profession. Experience plays a pivotal role in becoming a bounty hunter. If you have some work experience with the bail enforcement process, then this can be an excellent support to initiate a career in this field. There are unique licensing rules and regulations of each state. It is mandatory to fill in the basic requirements as well as complete educational details to qualify the licensing program. Also, background checks are performed by the experts to determine the involvement of an individual in criminal activities. How Much Time it Take to Become a Bounty Hunter? The total time needed by anyone to become a bounty hunter depends on one’s experience and background. If you have long-term experience of law enforcement then you will be able to work in this field without completing any extra training. 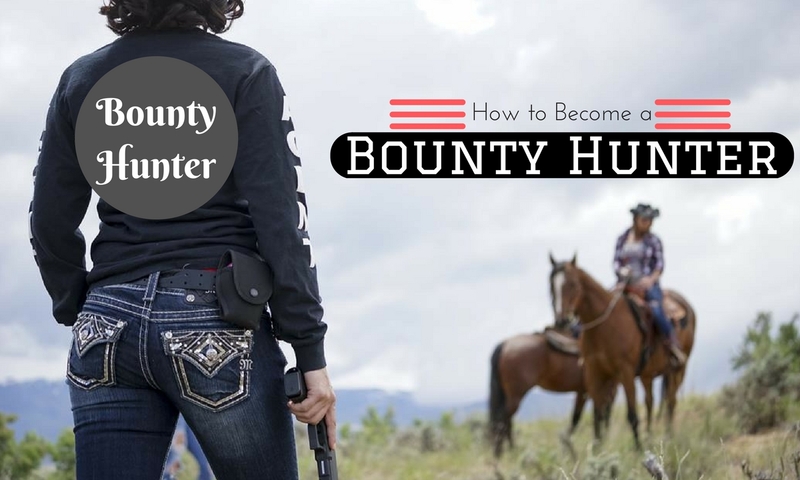 However, if you possess very less experience in the field and enter into the course of becoming a bounty hunter then you would be requiring longer time period to complete the training and gain skills needed to become a successful bounty hunter. The profession of bounty hunter is stressful but is financially rewarding. The bail enforcement experts usually work in exchange for monetary rewards. For this reason, it is difficult to outline a fixed income range for bounty hunters. The salary even varies from state to state. The salary of a bounty hunter is decided by the bail enforcement department of a respective state. On successfully completing the course and training to become a bounty hunter, one can be part of the US Bureau of Labor Statistics groups as private investigators and detectives. Even one can start his career as assistants to bail enforcement experts possessing strong experience and investigative skills. You can even begin your career working as a part-time bounty hunter. Once you gain experience and enough success in the field, you can then switch to full-time bounty hunter. With rich experience, you can even set up your own agency.